From Zelda to Final Fantasy, we've seen plenty of dedicated video game orchestral concerts over the years. 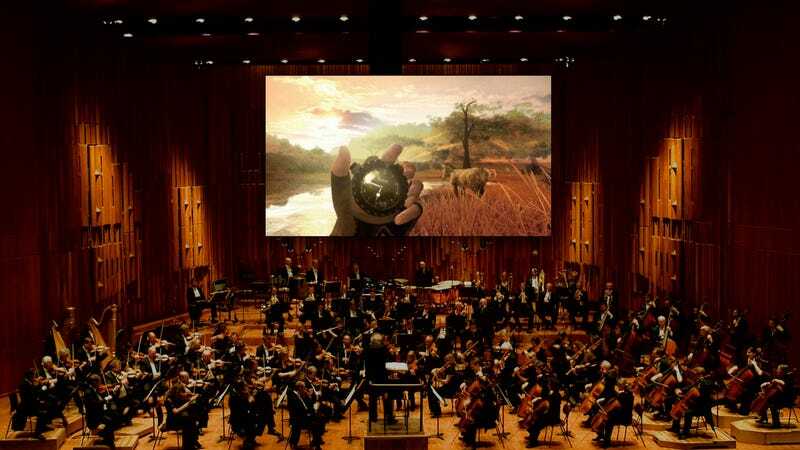 Only a week or so ago, there was a huge Legend of Zelda concert in Los Angeles, and next week will see the release of a collection of video game music from the London Philharmonic. I've listened to much of the Philharmonic album in advance, and I found that the tracks I enjoyed the most were the ones I'd never heard played by an orchestra. Orchestras tend to be going for a mainstream thing with these performances, so they focus on the themes we all know and love. But while I'm all for hearing the Mario "1-1" music or Cloud's Theme from Final Fantasy VII, I found that I was really digging hearing a full orchestra play the opening music from Grand Theft Auto IV, or the theme from Angry Birds. I thought it might be fun to list five pieces of music that aren't the first choices for game concert programmers, but which I would get excited to see on a concert program. Instruments ready? Everyone tuned up? And a 1, 2, 3, 4…. World of Goo — "Beginning"
Final Fantasy Tactics A2 — "Exceeding the Hill"
As much as I enjoy the opening music from this game (which plays when you hit "play" on the above video), my favorite track from this entire game (and, for some weird reason, one of my favorite pieces of video game music full-stop), is the second part, "Exceeding the Hill," which comes on at 1:50. It captures everything Tactics is to me—playful, thoughtful, and tense in an enjoyable way. Also, it is called "Exceeding the Hill," which is one of the best song names I have ever heard. Just listening to it and I want to start placing my party around the grid. Watch out for my juggler. The Secret of Monkey Island — "Intro"
Of course, this game has a much beloved soundtrack. And while it would just be cool to see an orchestra tackle its iconic themes, something I've found with this theme is that it actually sounded different depending on your sound card. As a result of that, the video I've posted above is what I think of as the "definitive" version, but for many folks theirs was. So, there's wiggle-room on the soundtrack, and it would be fun to hear what an orchestral arranger would come up with. Plants vs. Zombies — "Watery Graves"
Of all the pizecatto string tunes that would work well if performed by an orchestra, Laura Shigihara's "Watery Graves" from her Plants vs. Zombies soundtrack might be my favorite. This is a track that was clearly created within a recording program—the delay that's bouncing off of all of the instruments gives it a watery, echoing quality that would be difficult to reproduce in a traditional orchestra. But that's exactly why I'd love to hear it! Far Cry 2 — "Dark River"
Stephen has started joking that I'll post about Far Cry 2 whenever I'm given an opportunity. I have no idea what he's talking about. But speaking of Far Cry 2, let me tell you about this track! In all seriousness, many of the tunes that are performed at these orchestral shows are the main themes from games, the big heroic anthems, the most iconic moments. But in music just as in games, pacing is very important. A good concert needs some other contours, and Marc Canham's Far Cry 2 soundtrack is loaded with contours. This track, "Dark River," is one of my favorites. Canham ditched the more common focus on heavy percussion and driving melodies to focus on sparse, textural stuff, appropriating a lot of African harmonies and rhythms along with a surprising amount of horror-film string tricks. This track makes me think of Far Cry 2 more than almost any other, and if it fired up in the middle of a video game concert, I would probably leave my chair and start sneaking up on people in the lobby. With a machete. Y'know, if I'd brought a machete.